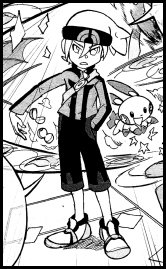 Alpha is the youngest of two twin brothers who hear about the legendary pokemon Groudon and Kyogre. His goal is to capture Kyogre. He is the calmer and more cautious of the two brothers. 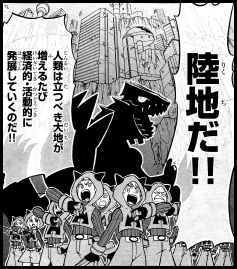 Alpha had a Kimori and a Taneboh in the preview chapter. 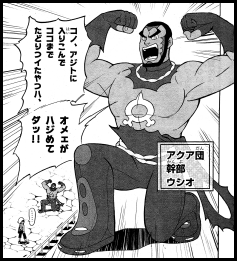 In the Omega Ruby Crimson Passion portion of the November 2014 chapter we see that he was the original owner of Omega's Hasuboh before trading it for his Taneboh. His Kimori would go on to evolve into a Juptoru and again into a Jukain. His Taneboh would go on to evolve into a Konohana and again into a Dartengu after being exposed to a Leaf Stone. He also has a Plusle and a Whaleko. Omega is the oldest of two twin brothers who hear about the legendary pokemon Groudon and Kyogre. His goal is to capture Groudon. He's a bit more hot-headed than his younger brother, choosing to just barge into the Magma-Dan's headquarters instead of taking a more subtle approach. 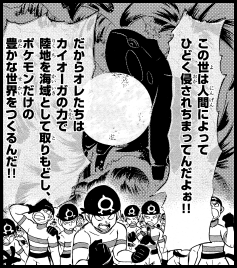 Omega had a Mizugorou and a Hasuboh in the preview chapter. 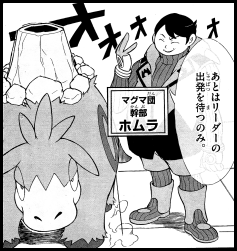 In the Omega Ruby Crimson Passion portion of the November 2014 chapter we see that he was the original owner of Alpha's Taneboh before trading it for his Hasuboh. His Mizugorou would go on to evolve into a Numaclaw and again into a Laglarge. His Hasuboh would go on to evolve into a Hasubrero and again into a Runpappa after being exposed to a Water Stone. He also has a Minun and a Whaleko. Daigo is a young man who tells Alpha and Omega the legend of Groudon and Kyogre. 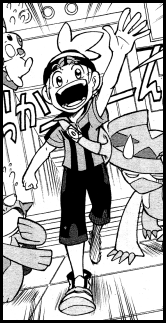 He seems to be happy seeing how eager the boys are about wanting to capture these pokemon. Later, he gives both Omega and Alpha a special "Devon Oxygen Tank" and the HM Dive to aid them in their search for the Seabed Cavern. The Magma-Dan is an organization that wants to capture Groudon and use its power to increase the land mass in the world, enabling humans to expand their activities to new corners of the planet. Their plan, however, will come at the cost of the pokemon who live in the sea. They face off against Omega in their hideout but are soon overtaken by the young Trainer's pokemon. Homura is one of the Admins of the Magma-Dan. He attempts to stop Omega from boarding the submarine that will take him to the Seabed Cavern but is unable to defeat the young Trainer's Laglarge. 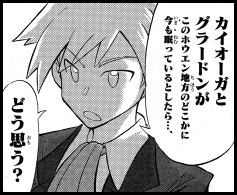 Homura doesn't care about the pokemon who will lose their homes if the Magma-Dan achieves its goals, saying that he wants to make a paradise for humans, not pokemon. The Aqua-Dan is an organization that wants to capture Kyogre and use its power to increase the sea levels in the world, creating a beautiful planet where only pokemon live. Their plan, however, will come at the cost of the pokemon who live on land. They face off against Alpha in their hideout but are soon overtaken by the young Trainer's pokemon. Ushio is one of the Admins of the Aqua-Dan. He attempts to stop Alpha from boarding the submarine that will take him to the Seabed Cavern but is unable to defeat the young Trainer's Jukain. Ushio has a unique way of speaking that mimics the way he speaks in the video games.